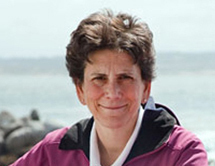 Barbara Block is the Charles & Elizabeth Prothro Professor in Marine Sciences Evolutionary, Cellular and Molecular Physiology at Stanford University. She received her PhD from Duke University. Driven by a lifelong awe of the sea and a fascination with its amazing creatures, she’s a renowned marine scientist and a pioneer of the technology used for open ocean observation. Her lab is based at Stanford's Hopkins Marine Station, where her research focuses on how large pelagic fish utilize the open ocean environment. Her research of tunas, billfish, sharks, and other migratory marine animals using satellite tagging and innovative tracking techniques has greatly expanded our knowledge of highly migratory fish behavior, physiology, ecology and how fishes interact. Block and colleagues at the Monterey Bay Aquarium collaborated to establish the Tuna Research and Conservation Center, a unique facility that permits physiological research on tunas. They are employing new techniques in remote wildlife tracking and data collection, and molecular genetics to directly examine the short and long-term movement patterns, population structure and behavior of tunas and billfishes. Among her most remarkable discoveries are three prodigious seasonal ‘hot spots’ off the California coast that draw sea life—mostly predators—from across the Pacific by the thousands. Block calls this region the ‘Blue Serengeti’ for its resemblance to the great game reserves of Africa where predators still range free. Block’s objective is to study the whole Pacific realm and to observe how the largest ecosystem on Earth works, from the top down. Her research has revealed that populations of sharks and tuna migrate across thousands of miles of ocean, year by year, and dine at the same “predator cafe”. Understanding the behavior of these vital top predators enables scientists to build a ‘report card’ on the health of the world’s ocean and to improve how we manage marine conservation efforts. Beyond the important scientific data on wildlife she is revealing, Block sees her research as a way to deepen the public’s understanding and love for ocean animals. By linking the behavior and travels of sea creatures directly with ordinary people through technology apps, she hopes to engage them in the same way that visitors to national parks experience wildlife. She believes that people love seeing lions, rhinos and zebras in the Serengeti – and they understand why they need to be protected. She sees the challenge as doing the same for the ocean, where it is not easy for people to see the animals. Block believes that allowing the public to share in the wonder of discovering the life of the ocean will, in time, help build a social consensus for the creation of a UNESCO World Heritage along the California coast, and support global moves to conserve ocean wildlife. Block has received numerous prestigious awards including being named a 2012 Rolex Enterprise Laureate.